Located in one of Asia’s great kingdoms and Europe’s powerful colonial empire’s is the Malaysian city known as Penang. 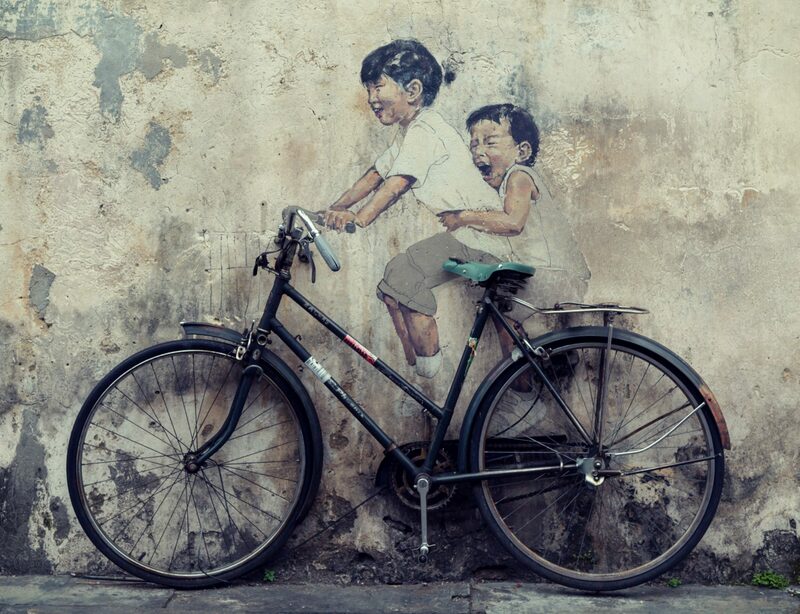 Cycling in Penang has become famous from the accessible streets and artwork. Penang is primarily a region of tropical abundance with dense mountainous jungle and farms growing exotic produce such as durian and nutmeg. The island also boasts one of Malaysia’s most diverse and exciting cosmopolitan cultures in the shape of the main city, George Town. The UNESCO heritage site demonstrates old-world Asian charm. (think trishaws pedaling past old watermarked Chinese shop houses and wild chickens running rampant about the streets). The climate is hot and humid with average temperatures ranging from 27-30 degrees Celsius year round and so may pose a challenge to any cyclists who are used to the mild weather of northern Europe or the UK. If you don’t mind getting a decent sweat on then it this is the location for you! Check out the video above by Penang Bike Share which gives a nice demo of the cycling available in the area. If you’re in town for a short while and only need a bike to cruise around town make sure you take a look at Link Bike​. Link Bike is part of an initiative taken by Island’s City Council, which is hoping to take Penang one step closer to a livable international city. Anyone can take one of the bikes from any of the 25 stations dotted around the city and return it to another station. If you’re looking to rent a bicycle the duration of your stay I’ve listed a few resources for you to take a look at the end of the article. The most popular cycling route around Penang is to cycle around the island. The route takes off from George Town and turns south on the Jelutong Expressway towards Bayan Lepas, curling around the southeastern foothills before touring through the impressive western plains of Balik Pulau. Bikers then climb up and over the hills to Teluk Bahang, before heading back to Geroge Town through the beautiful town of Tajung Bungah. The route is 82km in total and would take a moderately fit cyclist approximately five and a half to six hours to complete if hills are not a bother to you. The entire route comprises several interesting sections that could on their own make a very enjoyable ride on their own. The Jelutong Expressway offers those interested in road cycling a wonderful surface for time trialing and triathlon training, loops of up to 50-60km can be drawn out to suit your preferences. For those looking for something less challenging than the full island loop, a 25km ride from Geroge Town to Teluk Baharng could be just the ticket. This popular route is revered for its liveliness and enjoyable seaside cycling. The route can be slightly technical at times, twisting in sections but should not pose a significant challenge to anyone with moderate experience on two wheels. Cyclists who feel less comfortable in traffic may fare better with a gentle pedal around the idyllic charms of the Penang Botanical Garden and the many residential areas in the vicinity. Pearl Hill, located inside the gardens, is a magnificent place and loved by local cyclists and joggers for the nice views offered at the summit. The climb is a challenging one, and locals strive to complete it in less than 10 minutes. If you’re up for a real test, the unofficial 10 lap challenge of the climb will be sure to induce more sweat that you thought was humanly possible. The current unofficial record time is just under two hours, so it’s worth a shot to see how stack up! There is much off-road riding, and up to 80% of bikes in the region are of the mountain variety. There are many trails from the central inland hills to the coastal foothills. However, it’s not advised to attempt to locate your own routes as a tourist, local knowledge is essential. So make sure you get in contact with one of the many local cycling tours for the best information on safe routes. If you’re a fan of road cycling, Penang Island is not the best due to its size. For those seeking a serious road experience other than the loops on the Jelutong Expressway, it’s worth considering making the trip across from the island to the mainland. On the mainland, you can discover the rice fields of Kedah and the ancient stupas of the Bujang Valley with routes from 100-200km. Fully supported tours are often organized by one of the many cycling clubs so again, make sure to contact them upon or before arrival. After you’ve finished riding, Penang has a lot to offer regarding attractions and nightlife. The youth park hiking trail offers walkers a great view over the city. It’s the closest city break from Penang so make sure you bring your camera! Of course, no visit to Penang would be complete without sampling some of the local cuisines. Excellent Street Hawkers are found dotted throughout the island. The top pick for street food is a local restaurant called Teochew Chendol. Here you can sample delicious Chendol and other local dishes. It’s a crowded place, especially on weekdays -delicious and very budget friendly. Antzrabangsa Enterprise (The Elbow) is the place to go if you’re on a budget and looking for a beer. I spent most evenings here chatting away in my flip-flops at this fun venue. Penang is a fantastic place to experience by bicycle. There is a great number of routes to choose from and something to suit every taste and requirement. You’ll be amazed by the scenery, the locals and the and richness of Malay culture that enriches your experience at every turn. It’s The Topeak MTX Trunkbag DXP Against The EXP: Go! Such a nice article, we liked it very much.